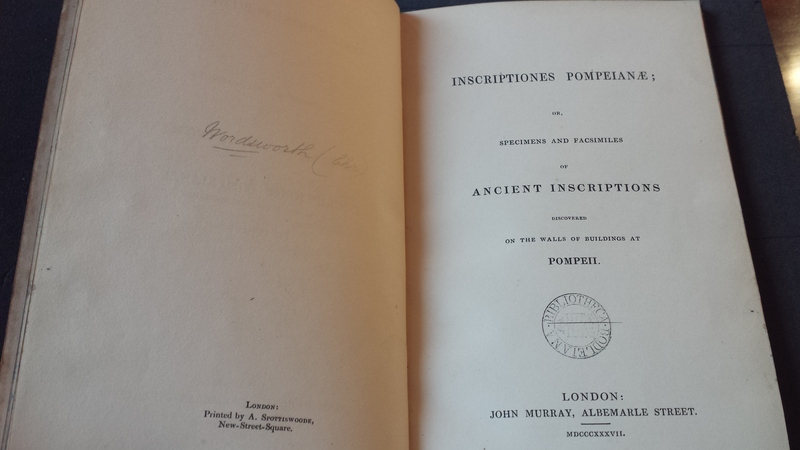 I recently came across what is quite likely the earliest treatise to appear on Pompeian graffiti: Inscriptiones Pompeianae; or Specimens and Facsimiles of Ancient Inscriptions discovered on the walls of buildings at Pompeii. Published in 1837, this small volume penned by Charles Wordsworth, nephew of the famous poet, Classicist, and bishop of St. Andrews, is, if not always entirely accurate in its interpretation of the texts, nonetheless an altogether lovely presentation of the texts scratched into the walls of the ancient city. A mere thirty-three pages, this slim volume takes the form of a letter Wordsworth addresses to a friend – his dear P—, who seemingly accompanied him on a trip to Pompeii in 1832. He states the letter is ‘retaliation’ for P, who indulged in ‘some pleasant humour’ for his interest in the graffiti they saw on their trip. He further writes that he ‘should indeed have abstained from this undertaking as unnecessary, had any notice whatever been taken of these fragments to which I now invite your attention, by any of the writers who have described the antiquities of Pompeii.’ He claims (rightly) that apart from a few vague references in William Gell’s revised 1832 publication of Pompeiana, no one has yet mentioned the texts in print, much less published them in any way. This then, is what he sets out to do. Wordsworth invites P to join him, as he acts as guide, to go back through the streets of Pompeii, and examine more thoroughly a number of the ancient graffiti. Likely to pique the interest of his friend, Wordsworth begins with a text from Vergil, P’s favourite Latin poet, which is to be found on a wall in the Building of Eumachia. Wordsworth demonstrates again and again throughout the book his thorough knowledge of ancient literature, but more astonishingly, an understanding of the graffiti and the culture of writing on display on the walls of Pompeii that is not always found in later (dare I say, even recent) works on the Pompeian epigraphy. This is clear in his recording of the following text, one of many found in the Basilica. Here, the writer combined the words of two poets, Ovid and Propertius, who wrote similar entreaties regarding gifts, matchmaking, and the difficulties of love. Wordsworth’s attention to the graffiti shows, in many ways, that he was ahead of his time, not just in the recording of the texts, but in his appreciation for them, for the literary and literate proclivities of the Pompeians, and for recognising what an important artefact these scratched words were. For that, I would argue anyone working on ancient graffiti or Pompeii owes him a great deal of admiration and gratitude.